The Arabian or Arab horse is a breed of horse originating from the Arabian Peninsula. Arabians have a distinctive head shape and high tail carriage, which makes them stand out from most other horse breeds. This is one of the oldest breeds, and archeologists working in the Middle East have found approximately 4,500-year-old remains of horses that look similar to today’s Arabians. Arabian horses dominate the discipline of endurance riding but are also successfully competing in many other equestrian sports. 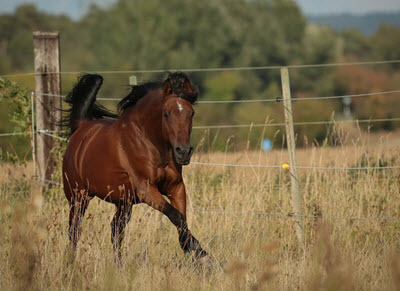 Their desirable characteristics, such as speed, endurance, and strong bone have led to them being included in the creation and betterment of many other horse breeds. Arabian horses are not used for tasks where being heavy-weight is important, such as plowing and other though drafting. Yet, their light-weight does not mean that they are unsuitable for fairly heavy riders since they are strong enough to carry quite a lot despite not being very bulky themselves. The breed standard established by the U.S. Equestrian Federation describes the Arabian horse as standing between 14.1 to 15.1 hands, with the occasional individual over or under. 14.2 hands is the generally accepted cutoff height between a pony and a horse, but all Arabians, regardless of size, are considered horses and not ponies. The head is refined with a characteristic wedge-shape. The eyes and nostrils are large. Most Arabians have a noticeably concave profile. Many Arabians have a jibbah, which is a slight bulge on the forehead between their eyes. This extra space adds sinus capacity, and it is believed to be an adaptation to life in a dry desert climate. The windpipe is large and well-set. The throatlatch is refined and clean. An ideal Arabian have a long mitbah (structure of the poll and throatlatch) since that allows for flexibility in the brindle and plenty of room for the windpipe. Most Arabians have a compact and short-backed body. The croup (top of the hindquarters) is level and relatively long. When it comes to muscle, there are variations within the breed. Some horses feature especially powerfully muscled, and winder, hindquarters, and those individuals are often used for reining and other activities where intense bursts of power are necessary. Individuals with leaner muscling, and more narrow hindquarters are more suited for activities that require endurance rather than explosive short-term power. The Arabian tail carriage is high. An ideal Arabian will have a deep, well-angled hip and well laid-back shoulder. 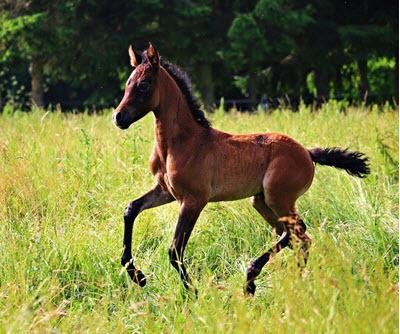 Generally speaking, Arabians have dense, strong bones and good hoof walls. Compared to many other breeds, their bone density is high, which helps to make them strong – much stronger than you might think when you just look at their small and refined appearance. They tend to have short cannons, sound feet, and a back that is short and broad. Interestingly, some Arabians have only 5 lumbar vertebrae instead of 6, and only 17 pairs of ribs instead of 18. They Arabian horse developed among the nomads in the desert. To protect the horse, both from thieves and from the harsh desert weather, it was not uncommon to let the horse stay in the same tent as the family – especially if it was a high-quality mare. This meant that they had to be able to handle living in close quarters with humans, including children. Arabian horses are generally described as intelligent, alert, sensitive and spirited. The Arabian is classified as “hot-blooded”, putting it in the same category as Thoroughbreds, Barb horses, the Akhal-Teke, etc. Arabians seldom become vicious, unless they have been either heavily spoiled or heavily abused. Of course, their intelligence allows them to quickly learn undesirable things as well as those things that the human wants them to learn. For safety reasons, the United States Equestrian Federation only allow children to exhibit stallions of a few select breeds in show ring classes, and one of those breeds is the Arabian.